In the future, this page will contain information to help you make your own goat milk soap, including my own recipe that I developed and refined for over a year. Until I find time to write the soapmaking section of this website, though, I thought you might enjoy checking out these quality resources that can help you now. They're ready for instant download, and, of course, they all offer a money-back guarantee! 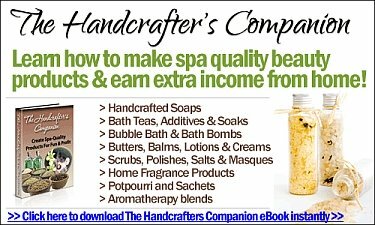 The Handcrafter's Companion contains 126 detailed recipes for soaps, lotions, spa treatments and much more. Plus, bonus material shows how you can easily set up your own profitable business! If you like to pamper yourself, but don't like the high cost of spa products, you HAVE to try this fantastic ebook. If you've been trying to learn how to make soap from free sources on the internet, you've probably read a lot of conflicting information, and may be confused or even terrified of trying to make your own soap! 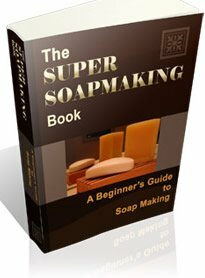 Sandy Simmons' Super Soap Making Book is the perfect solution for beginning soapers. With this ebook, you'll learn right away how to get started and how to avoid common mistakes and problems. That's not all--when everyone starts offering to buy your amazing soaps, Sandy gives you the knowledge you'll need to set up a business, too! Making handmade soap is one of the most rewarding skills I've ever learned, and if you're inclined to try it, I'm sure you'll feel the same way. So, order the Super Soap Making Book and start reading right away! Are you the kind of person who wants to see how something is done? Then the Soap Making Fun video was made just for you! The 53-minute video and manual plus three bonus guides will have you making soap before you know it! There's nothing like having a professional right there with you when you're learning a new skill, and this video will give you the insider's scoop on everything you need to know to get started in the right direction. Put Your Soap to Good Use! After you've learned how to make your own handmade goat milk soap, consider donating some to help the homeless and victims of domestic abuse. Click the banner below to learn more. 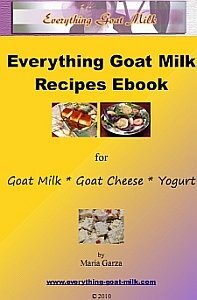 Sign up for our newsletter, and receive a FREE 39-page ebook that includes ALL the recipes using goat milk, goat cheese and yogurt on this site! I promise to use it only to send you The e-Goat Milk Minute. Selections change, so check back here soon for any new varieties of soap!